One has to wonder why a person, who seemed to have been successful in their chosen field, would have sunken to such desperate acts. One can only believe that when people discover this past, Robert Mitchell will have a very hard time overcoming the judgement of people. 29 Comments on "Robert Mitchell Arrest History"
But not to be confused with the candidate Robert Mitchell running against Dave Wilson. I’m sure that was simply an oversight. In other news, Trump endorsed candidate Ayotte today. I figured Trump would endorse Don Ayotte. I’m shocked it’s not the headline at his site. Wow, he looked really different when he was younger. The dishonest press is reporting that Trump endorsed Kelly, not Don. Sad. Was that Steve GROSSMan, Steve Smyk, Steve Smykman, Steve Schumck or Steve SchmucKKKman? Don’t worry folks, Frank is the ultimate coward. He has ZERO guts as he always dumps on people who have achieved more than poor Frank which is almost everybody. Frank is a chump now and will always be one. Really Puzzled? Where did I mention any candidate or campaign? I am not responsible for any conclusions you jump to. I put up a link. Go to bed, you need the rest. I don’t get this post. It isn’t funny. It isn’t clever. It is rather stupid. Exactly. What’s the point? Frank being Frank. What’s new? How can you call yourself a Christian when you are hell bent on destroying people’s reputations to sway the voting public opinion? You have maliciously attacked Bob Mitchell enough to have a track record of malicious libel, for Bob to sue you, I hope he does, you scumbag. Your post is an outright lie. Steve smyk has sold his soul to special interests. His list of donors proves that. One thing he’s been good at is lining his pockets with special interest money via those wonderful white envelopes! Truth Bearer, can you show me one thing about this post that makes it about the candidate Bob Mitchell? Comments don’t count. Henry, consider the same question. I posted a story about a basketball player, nothing more, even has a link to the original story, for those smart enough to click it. Isn’t it odd how people can be mislead because they are lazy? But since you have brought Chicken Bob into the conversation, it does remind me of his post about Dave Wilson. He actually made claims and accusations about Dave’s integrity, and he still has not provided the names of the legislators he says he spoke to, or the name of the person at the Ag. Department. Maybe Dave Wilson should sue Chicken Bob. Your BS will cost Dave Wilson and Jeff Cragg the primary and Steve Smyk the election. Computers and the Internet simply weren’t made for morons like you. You are rotten to the core. Typical use of gutter level Alinsky tactics in a political dirty trick. 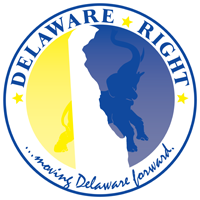 Delaware Right has sunk to a new low. AIM, how so? Are you blaming me because people can’t separate what is actually written, from what they expect to read? How can you call yourself a Christian when you ignore the words of Jesus and substitute old testament dogma in place of his words and behave and support a political party that is in direct opposition to the words of Jesus ? For a guy with a juvenile theft conviction on your record, you really are not in a position to point fingers or cast aspersions upon anyone’s character. RINO Hunter, see, now you made a direct statement about me that is false. But maybe there is a Frank Knotts out there who has a juvenile theft record. Do you think you are anonymous? LOL! YOU are one of the biggest liars and character assassins in Delaware. A dose of your own medicine and a page from your book. You are also one of the biggest SCUMBAGS in Delaware. If you think that’s bad, wait until the GROSSman Files come out.